Disney has a pair of coupons floating around for the upcoming 3D combo packs of the animated classics! 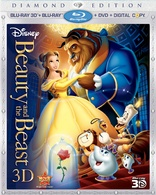 Disney Movie Rewards has just launched coupons to save $5 on 'Beauty and the Beast - 3D' and 'The Lion King - 3D' ($8 in Canada) coming to Blu-ray this month. Click this link to access the page where you can print out the coupons. The offer is available in the U.S. and Canada and expires on October 11.